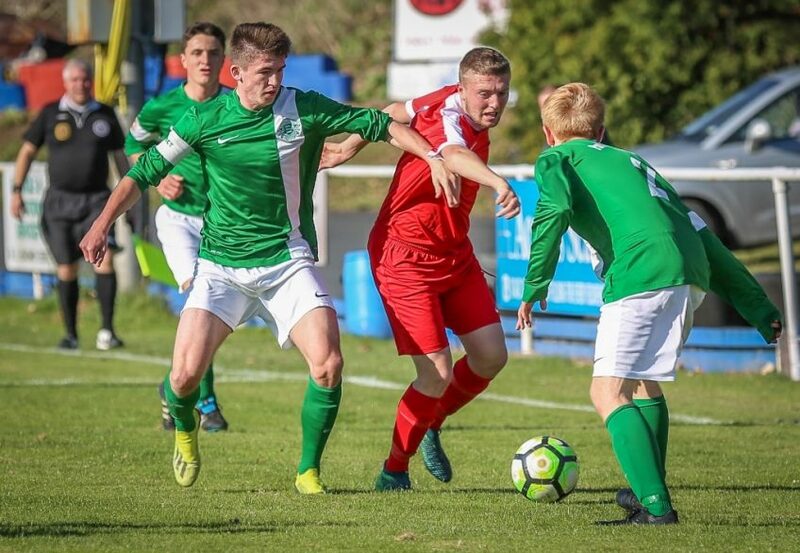 Guernsey 0-5 Essex, Saturday 3rd November 2018, Kick-Off 12:30pm, The Cycling Track, FA County Youth Cup Second Round. Essex cruised into the Third Round of the FA County Youth Cup as goals from Peter Oyetunji, Jay Bacon, Callum Fitzer, JJ De Souza Quissua and Rhys Sika-Nartey sealed a 5-0 win over Guernsey at the island’s Cycling Track. It was a first ever trip to the Channel Islands for Essex and a first meeting with Guernsey as the visitors progressed to Round Three for the seventh successive season, setting-up a tie away to Manchester in early December. The contest was quick to come to life and, within 6 minutes, Fitzer’s short corner found its way to Obi Molefi, who volleyed just over. Guernsey’s best chance came early in the first half as Callum Le Lacheur sent a low, angled shot inches wide. But Essex responded well, with Oyetunji finding Fitzer, who warmed the gloves of Guernsey goalkeeper Chris Mahy. But, with 14 minutes played, the mainland side took the lead as Molefi’s cross caused chaos and Oyetunji drilled in at the far post. Essex’s Jess Norey then produced a strike along the floor which was well held by Mahy, but the visitors didn’t need to wait long to double their lead. Bacon curled an exquisite 25th-minute free kick into the top left-hand corner. Molefi later saw his angled drive tipped wide, but the visitors were unable to add to their lead prior to the interval. After the break, Norey’s accurate cross saw Molefi nod inches over the top, before a third goal arrived on 64 minutes as the ball was cut-back for Fitzer to fire in. The win was then virtually sealed on 77 minutes with a fourth goal. Sofian Maghouz’s corner was nodded in by De Souza Quissua. Fitzer then slipped in Oyetunji, but the Essex front man was denied by a fine block from Guernsey ‘keeper Mahy. Two Essex chances then saw Fitzer bring another save from the overworked custodian. De Souza Quissua also watched his effort finish just over after a deflection. A full-stretch De Souza Quissua then slipped a low shot against the far post before hitting the upright again as his near-post effort rebounded clear. The fifth goal arrived a minute from time when Sika-Nartey got through on goal and slipped home a good, grounded finish. Essex: Josh Harrison (Southend Manor/Concord Rangers), Torgbor Torto-Tetteh (AFC Hornchurch) (Harvey Jolliffe [Brentwood Town], 62), Jay Bacon (Romford), Tom Duffy (Billericay Town), Jack McQueen (Barking), Tyler Cavener (Lakeside/Billericay Town) (JJ De Souza Quissua [Barking Abbey College], 66), Jess Norey (Romford), Sofian Maghouz (Romford), Peter Oyetunji (Romford), Callum Fitzer (Chelmsford College), Obi Molefi (AFC Hornchurch) (Rhys Sika-Nartey [Romford], 66). Unused Substitute: Lorcan Morrisey (Hullbridge Sports). Guernsey: Chris Mahy (Sylvans), Fin Piper (Guernsey Rovers), Callum Scott (St Martins), Brad O’Regan (St Martin’s), Harry De Moulpied (St Martin’s), Will Gray (Vale Recreation), Jake Robin (Guernsey Rovers), Charlton Gauvan (Guernsey), Thiago Rodrigues (Guernsey Rovers), Callum Le Lacheur (St Martin’s), Niall Hainsworth (Guernsey Rovers). Substitutes: Mario Cacare (Northerners), Corey Robilliard (Guernsey Rovers), Oscar Leadbetter (Sylvans), Seb Shephard (Guernsey Rovers). Assistant Referees: Nigel Bullen (Crawley) and Oliver Westgate (Crawley).